I'm not quite sure what I want to write here, and even more unsure how to phrase it without sounding cheesy. So please bear with me. The Internet can be a fantastic place. It allows us to visit far away places, introduces us to people from all walks of life and in all kinds of situations. It also opens our eyes to the plights and the triumphs of others. Over the years I've discovered a great number of people with fantastic life stories to tell. Stories of conquests, coping and just stories of, and about, really neat people! Granted, most of these stories I've discovered revolve around people who, by no fault of their own, are in need of an organ transplant. I'll probably never meet any of these people or will I ever know them, but I'm so very grateful for knowing of them through the Internet. One such person is Eva Markvoort. She's a 26 year old dynamo with CF...and what a spirited person she is. 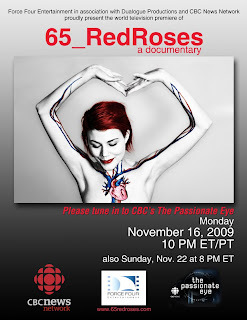 Her story is also the focus of a documentary airing in November on CBC's 'The Passionate Eye'. I urge you to tune and watch it. Also, Visit her blog at http://65redroses.livejournal.com/ and get to know her yourself! Oh...and please sign up to be an organ donor!